EPICA's 'Kick-Off Meeting' in Hunderfossen, Norway on 28 - 31 January 2018 brought the initiative's main partner organisations together to identify key goals and 'deliverables.' Representatives of the African Virtual University, ICWE, Makerere University, MyDocumenta, Open University of Catalonia and The Open University of Tanzania, joined the project coordinator, the International Council for Distance Education, for a discussion aimed at providing an overview of the project, analysing its structure, identifying constraints and evaluating its potential impact. In a series of separate presentations, the partners each outlined their role in the initiative and set out their proposals for future collaboration. The presentations all emphasised the project's innovative nature. 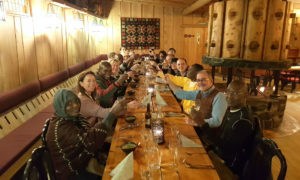 After the formal part of the meeting concluded, there were many stimulating discussions between the partners, who also took advantage of the opportunity to enjoy entertainment activities, including a sleigh ride and a cross-country skiing team-building exercise. Further information on the Kick-Off Meeting can be found here.